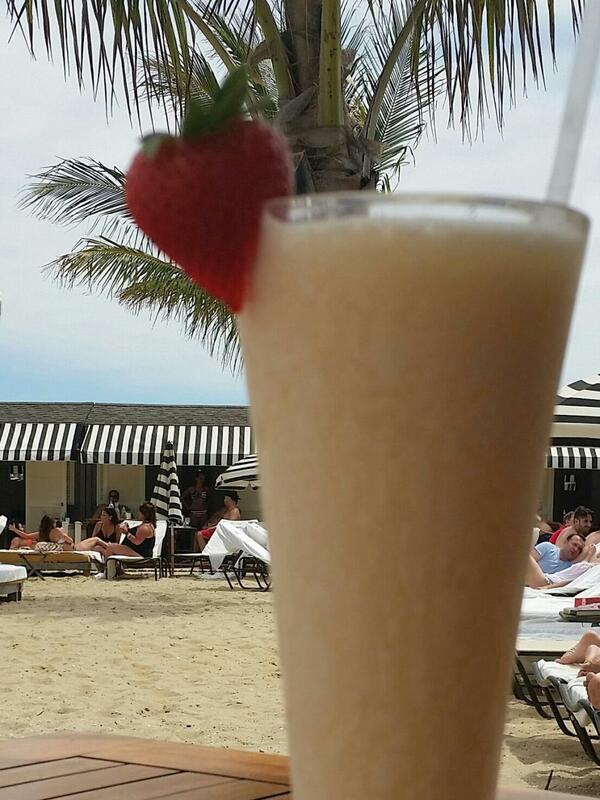 Let the heat go: Frozen drinks are an excellent way to cool off. From Hawaii to Maine, with Washington, D.C., too, these 51 icy cocktails are the most-delicious way to beat the heat. The Velvet Orange at Big Orange: Little Rock, Ark. 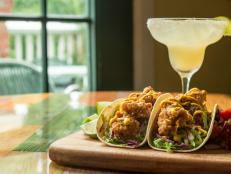 The popular Little Rock restaurant’s house signature cocktail is a bright and citrusy tipple that pairs well with its bold burgers and creative salads. 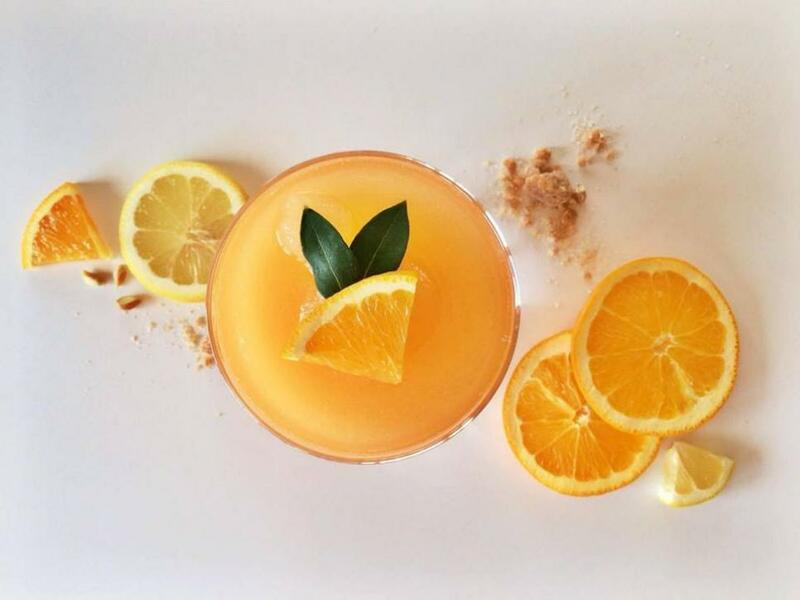 The fruity combination of vodka (from Rock Town Distillery downtown), orange and lemon juices, curacao and elderflower liqueur is balanced by bitters and a touch of bittersweet orange Aperol liqueur. This collaboration between Little Bird's bar manager Aaron Zieske and pastry chef Erin Hughes (on both the cocktail and dessert menus) is a play on the Tequila Sunrise. 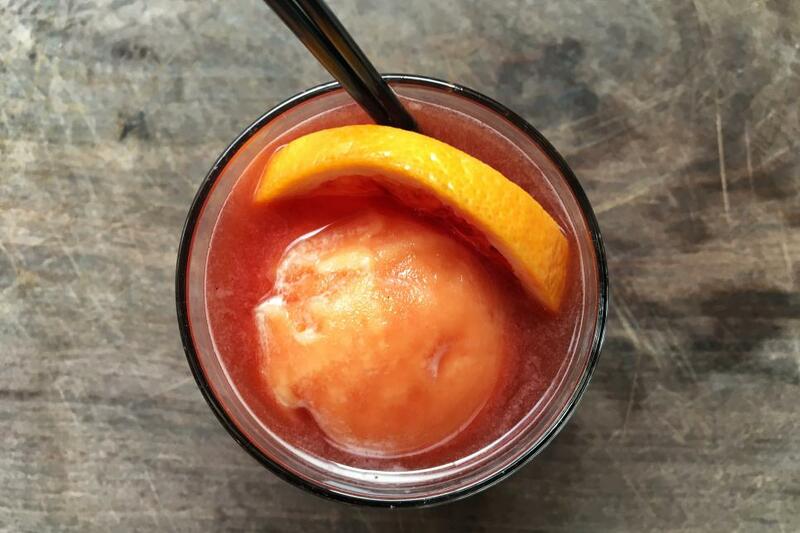 Blanco tequila and pomegranate grenadine are mixed together, poured into a rocks glass and topped with an ample scoop of brightly hued blood orange sorbet. Is it dessert, or a nightcap? Yes. 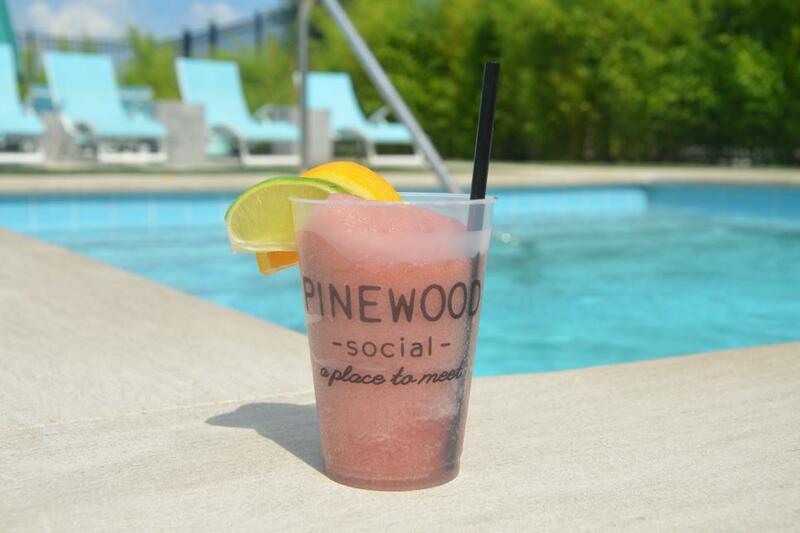 Bar manager Jacob Fisher wanted to serve something refreshing and fun that was a step up from the traditional rosé slushie at this mixed commerce and community space. 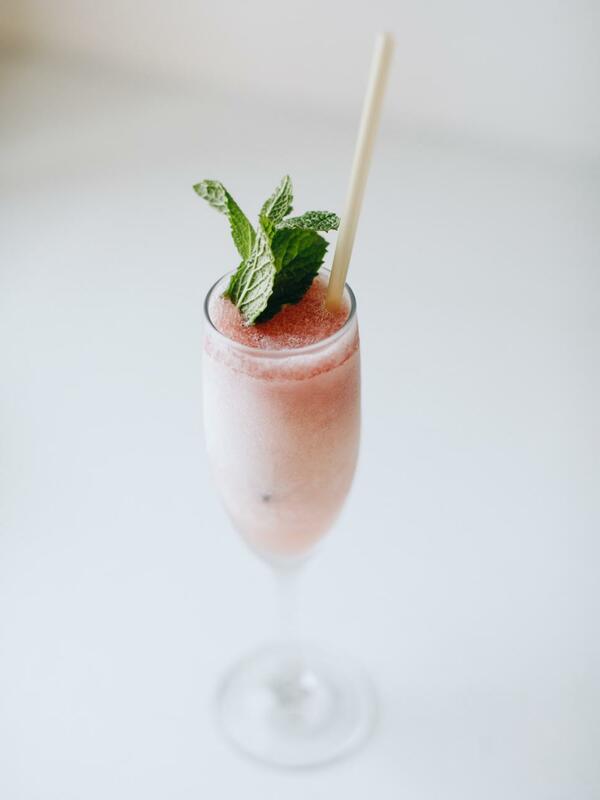 He blends California rosé wine with simple syrup and lime in a frozen-drink machine, topped with a choice of flavored liqueur. It’s low in proof so you can get brain freeze before a buzz. 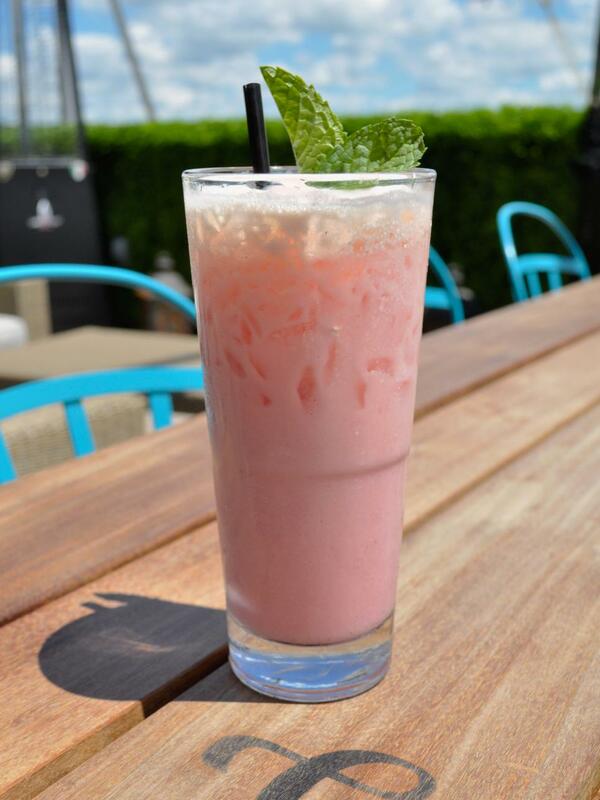 It's obvious that the city home to Kentucky's Urban Bourbon Trail would want to put the local distilled liquid in just about anything, including this slurpable frozen treat. 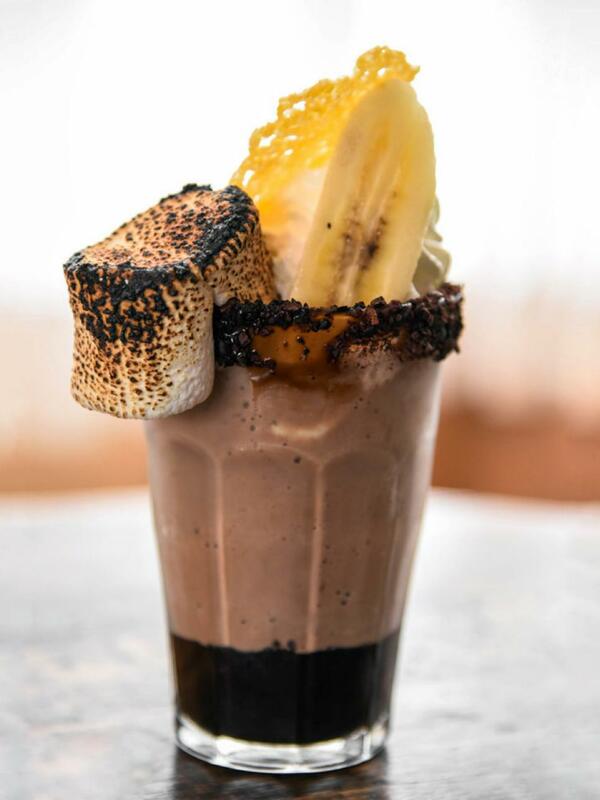 Milk, bourbon and chocolate ice cream are blended together and served in a cocoa nib-rimmed glass with whipped cream, cheddar tuile, caramelized banana and toasted marshmallow. After avoiding the frosé trend for so long, Matt Tocco and Branson Summers finally gave in and made one, albeit a version that’s complex enough for them to feel good about. 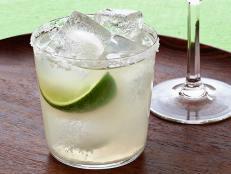 The base is rosé and blanc vermouth, with pisco added as a modifier to keep the drink in the low ABV world. 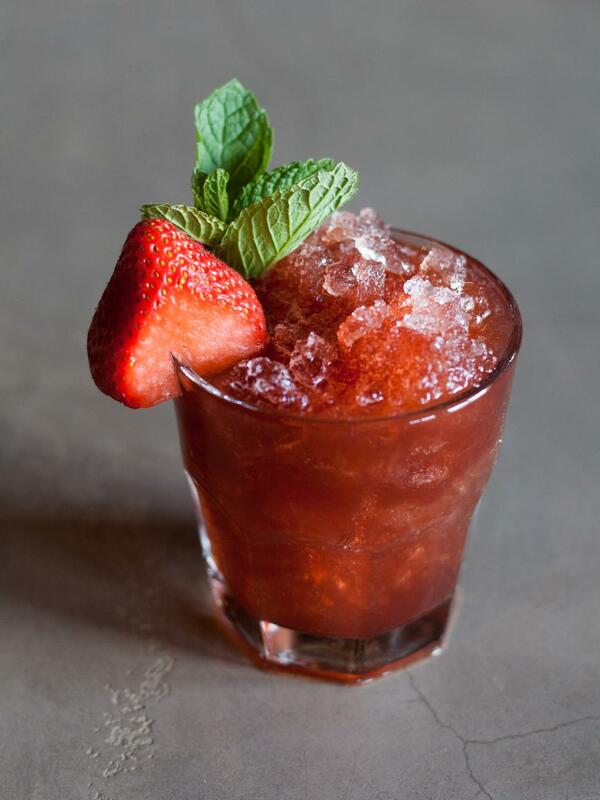 Strawberries echo the use of the wine, grapefruit juice adds tangy acidity and orange water adds brightness. Schnapsicles at Stable: Washington, D.C. In Switzerland, schnapps is far from the artificially flavored peach hooch used in fuzzy navels at college parties. Staff at Stable, a Swiss restaurant in D.C., is helping changing the schnapps reputation, putting a boozy twist on summery ice pops by mixing fresh apricots with mirabelle (plum) schnapps and white wine, served with prosecco individually or by the bucket. When staff at this Brooklyn barbecue joint was trying to come up with ideas for warm-weather libations at the end of winter, they were inspired by cases of the new vintage of rosé that were arriving. 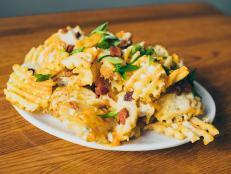 This recipe incorporates them, plus all of their favorite flavors of summer. They pour a pink bottle into a slushie machine along with grapefruit vodka, Aperol, grapefruit juice, lemonade and simple syrup, crank it on and chill. An adult nod to its silver pouch-packaged namesake, this cocktail summons flavors from pisco, green tea-infused vermouth, vodka, elderflower liqueur, strawberry-pink peppercorn syrup, passion fruit green tea and lemon juice. It’s served in a gem highball glass with an orchid blossom, so there’s no need to struggle poking a hole with a wimpy plastic straw. 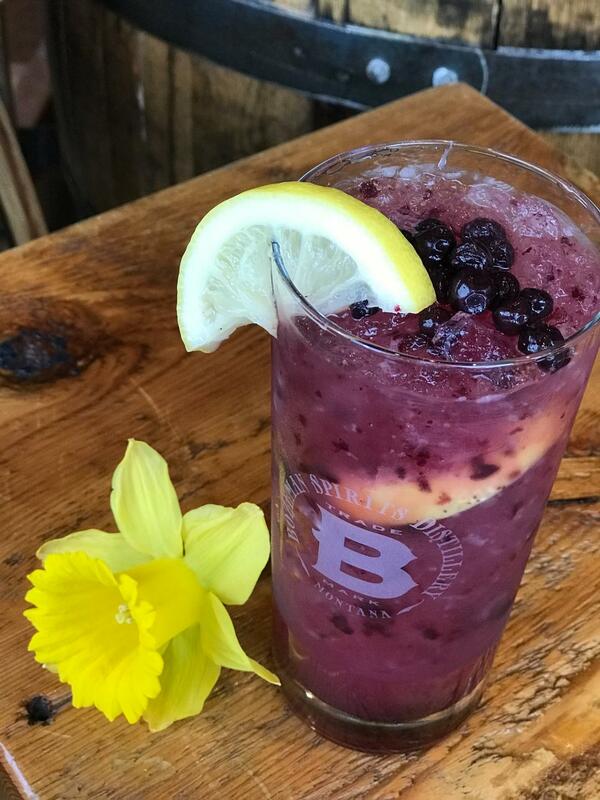 Named for the subspecies of American black bear native to Southeast Alaska that’s known to gorge on up to 30,000 wild blueberries before hibernation, this bright yet hefty cocktail at The Narrows melds plump local fruit and glacial ice. 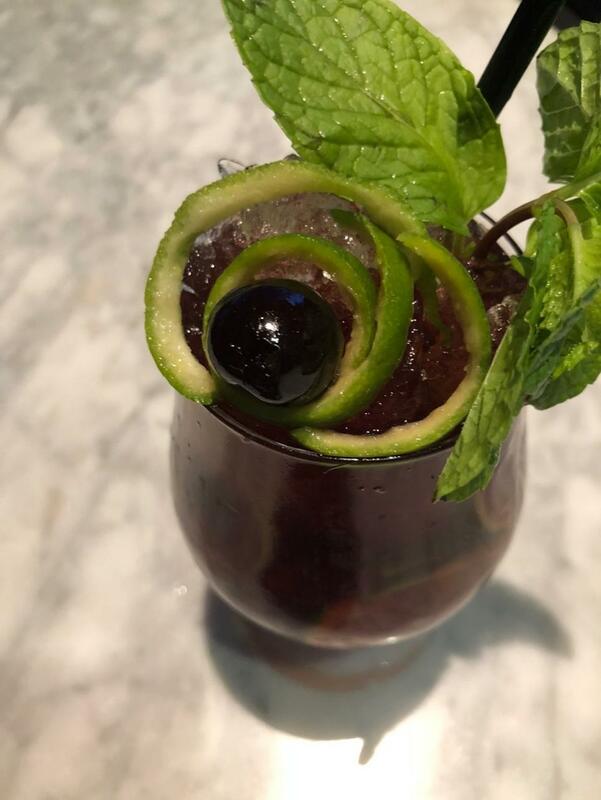 Aged rum is shaken with fresh mint, lemon juice and housemade blueberry syrup, all topped with ginger beer and poured over glacial ice shards. Childhood memories of strolling through the mall in suburban Springfield stirred Chef Victor Albisu to make a version of the frothy orange drink that was once ubiquitous at malls. 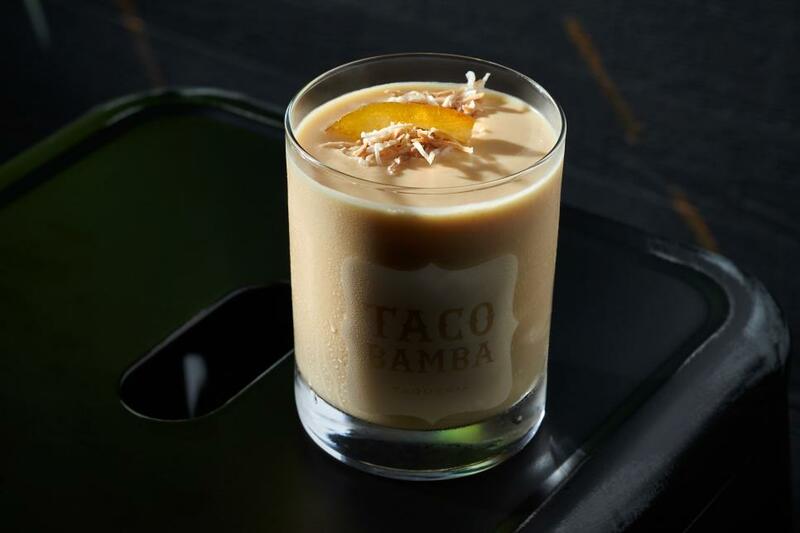 Tequila, orange juice, coconut cream and lime are blended with ice and served in a rocks glass sprinkled with toasted coconut flakes and garnished with candied orange peel. This rustic Italian restaurant on the campus of Auburn University riffs on the classic Venetian cocktail with this slushy libation that can be slurped alfresco, as a palate cleanser or as an after-dinner digestivo. 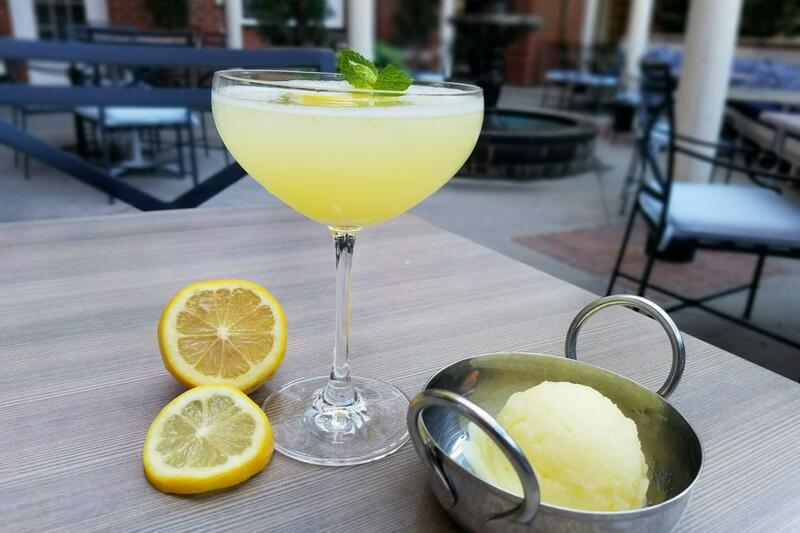 Lemon sorbet and prosecco are whisked until smooth, topped with chilled grappa and limoncello, and garnished with mint and a candied lemon wheel. 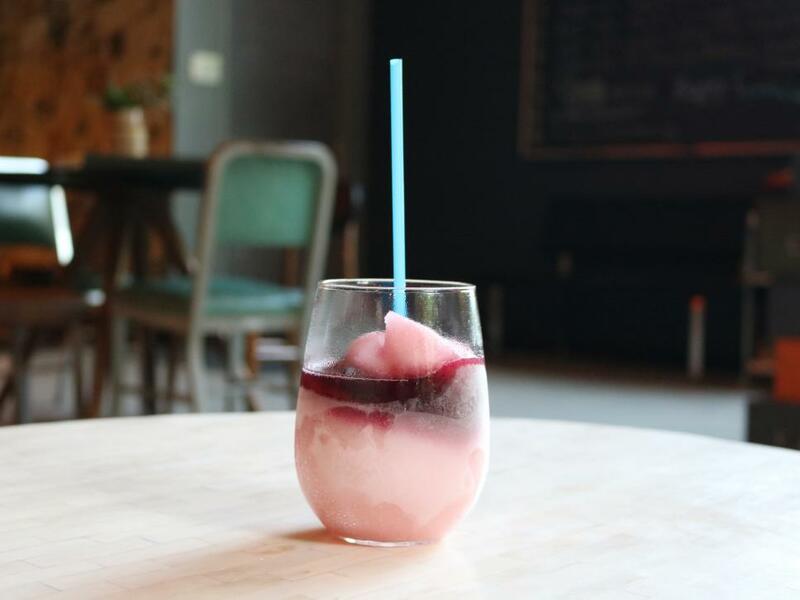 Created as a way to beat the oppressive summer heat, Tupelo Honey's take on ever-popular frosé starts by freezing rosé wine then scraping it with a fork, granita-style. 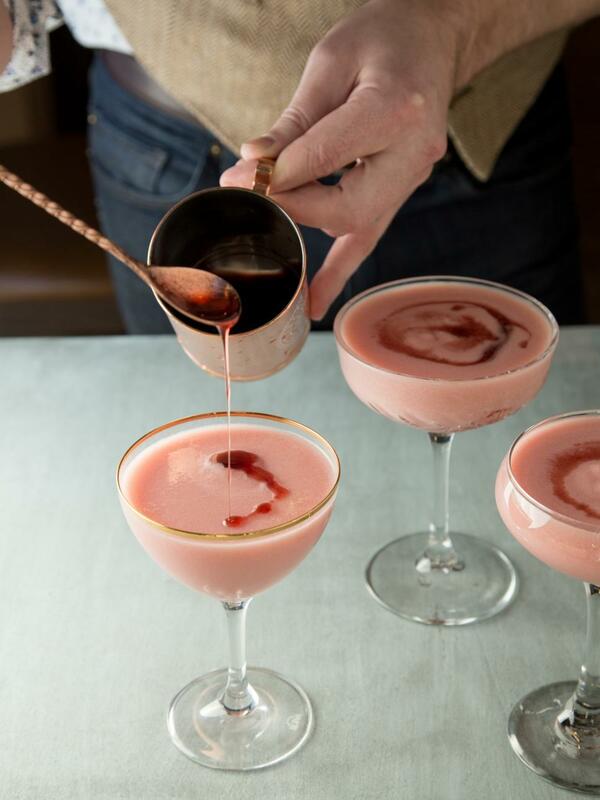 It’s shaken with mint-infused simple syrup, freshly made sweet and sour mix and maraschino liqueur, then served in a coupe glass and topped with a bourbon-infused cherry juice drizzle. 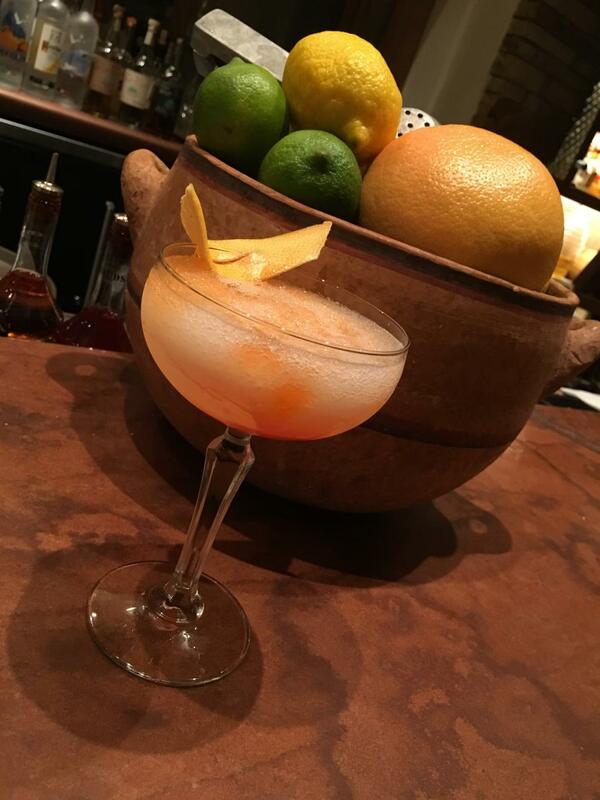 An homage to bartender Paul Squyer’s favorite wrestler, Sasha Banks, this drink is equally fierce, cool and bold. 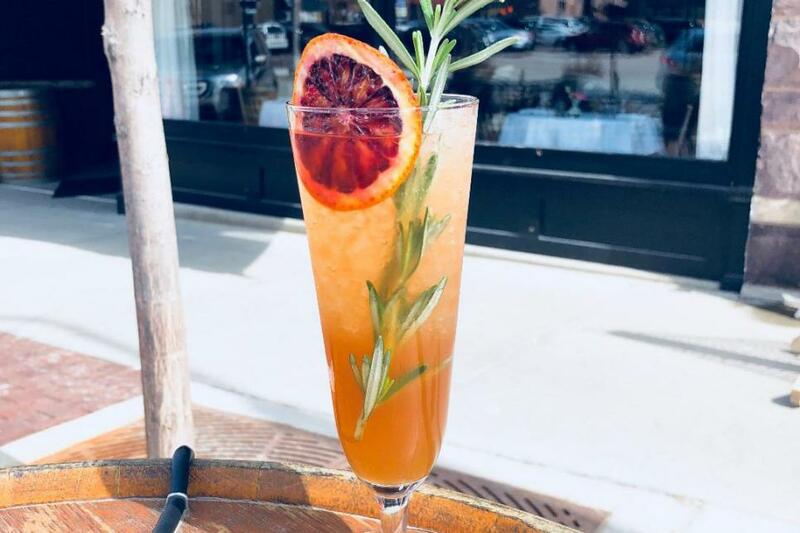 He shakes Venezuelan aged rum and blanco vermouth with blood orange-rosemary syrup and lime, pours it into a footed pilsner glass and garnished with a blood orange wheel and a sprig of rosemary. 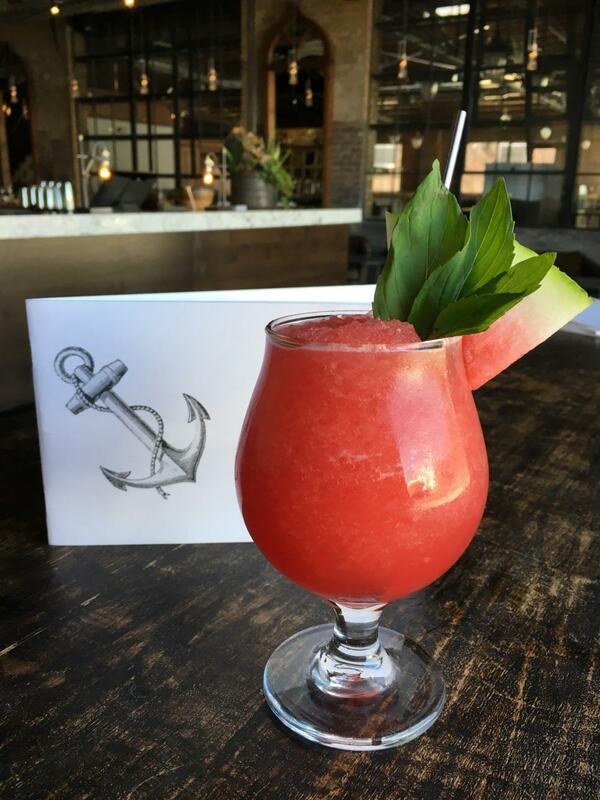 Named for the island separated from the Rhode Island mainland by a sound of the same name, this "unofficial" drink of Block Island is best sipped on the patio overlooking the water after a long day at the beach. Bailey’s, Kahlua and vodka are blended with just enough ice to make it thick and smooth but still drinkable through a straw. Mixologist Joshua James’ vibrant, tropical and fruity Southwestern spin on a Singapore Sling subs out gin for blanco tequila. It’s flash-blended for just a few seconds along with Benedictine, Cointreau, pineapple juice, grenadine, lime and maraschino, all served in a hurricane glass and garnished with an orange wedge. After a customer at the modern lounge joked that she could just drink the dressing from a spinach-strawberry salad, co-owner and lounge manager Rich West started experimenting. The resulting drink shakes muddled strawberry and mint with strawberry purée, lemon and bourbon, all fine-strained over crushed ice and garnished with mint and a strawberry slice. 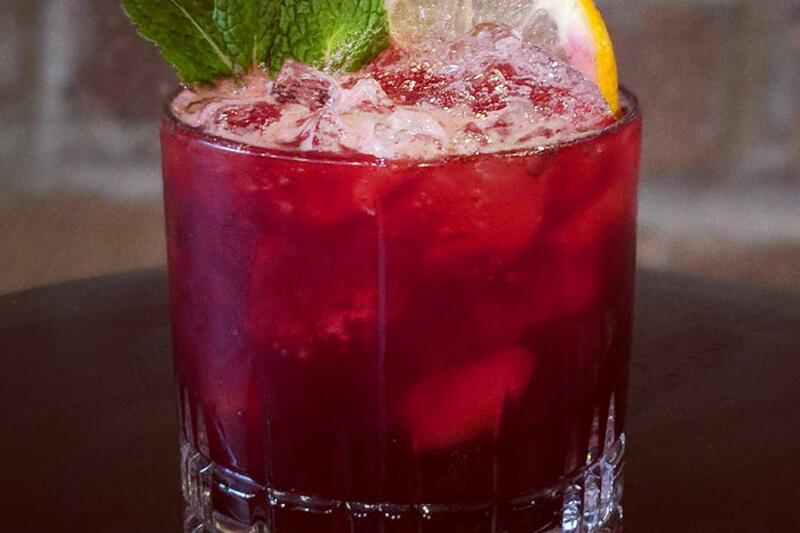 A marketplace and restaurant in the middle of Boise may be an unexpected place to take a culinary vacation to Spain, but this sangria is utterly transporting. 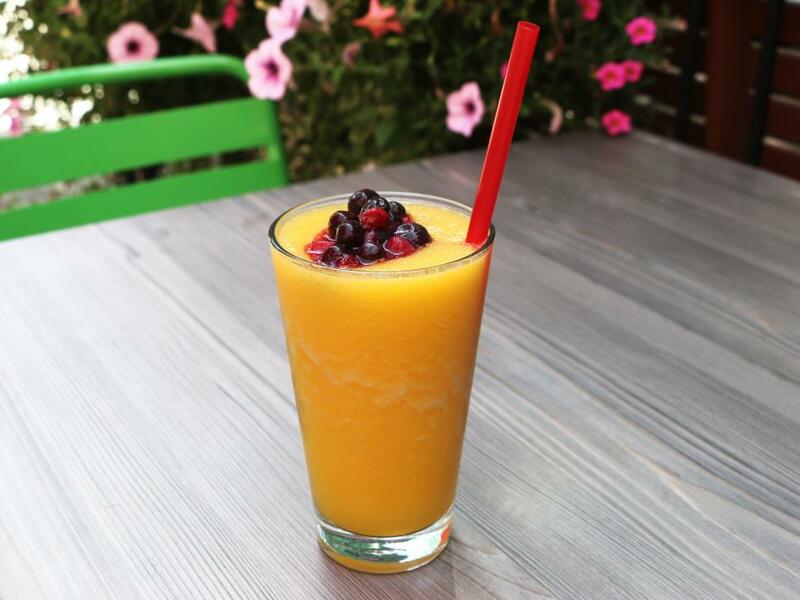 The fruit-packed drink mixes Rioja-grown Viura white wine with simple syrup, orange juice, pureed peaches, oranges, apples, grapes, lemon, limes and mango, all dispensed from a slushy-style machine. Remember to order the optional red-wine floater for an added kick. The drinks at this apothecary-themed cocktail den in Cincy are inspired by the team’s favorite childhood memories and flavors — I Spy, Chutes and Ladders and racy Spin the Bottle, for example. The delightfully decadent, summer-y sweet and low-ABV Monkey in the Middle is named for the kids’ keepaway game. 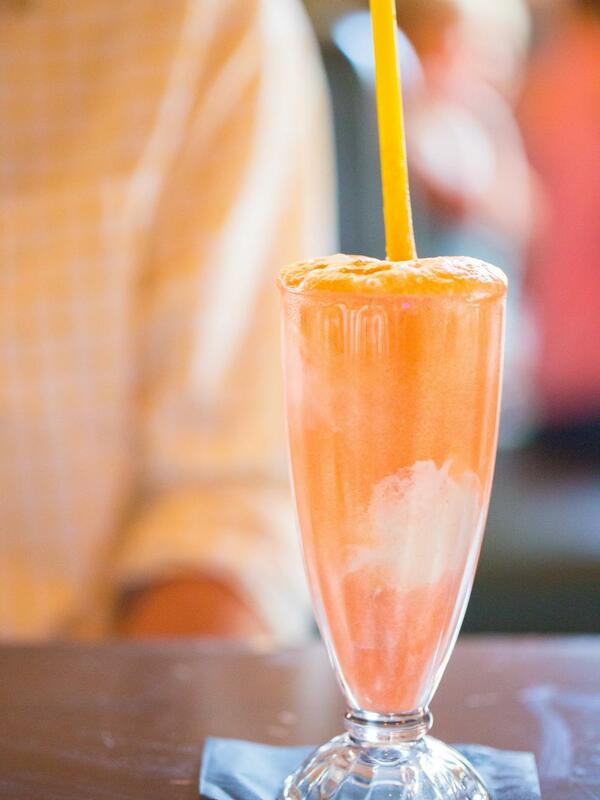 Cointreau, Aperol, elderflower liqueur and orange juice are shaken without ice until frothy, poured over vanilla ice cream and topped with club or cream soda. Bartender and manager Sean Woods cites Nothing But Trouble, the 1991 comedy-horror film starring Dan Aykroyd, Chevy Chase, John Candy and Demi Moore, as one of the worst movies with the most-amazing cast and a hilarious line: "Leisure time... kick back... nice... fish tacos." 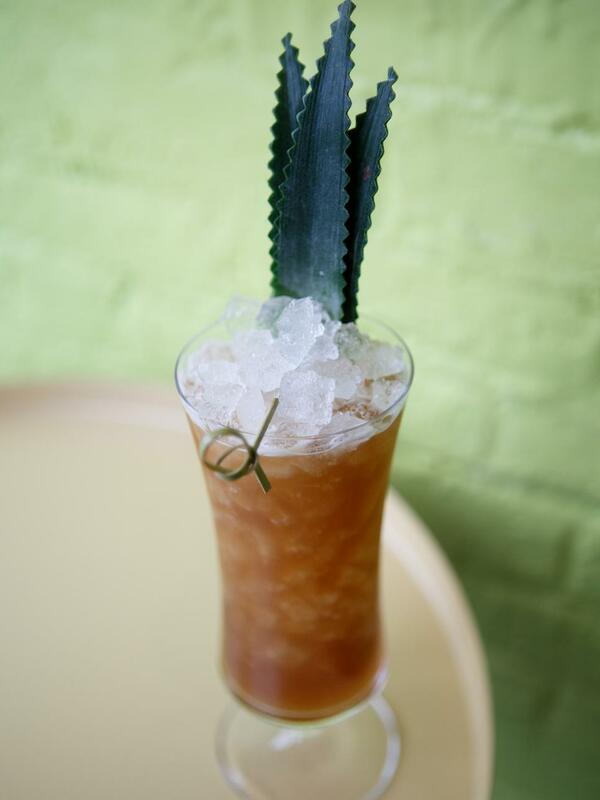 His drink evokes that feel, with a proprietary rum blend, pineapple syrup, espresso tincture, lime juice and tiki bitters. 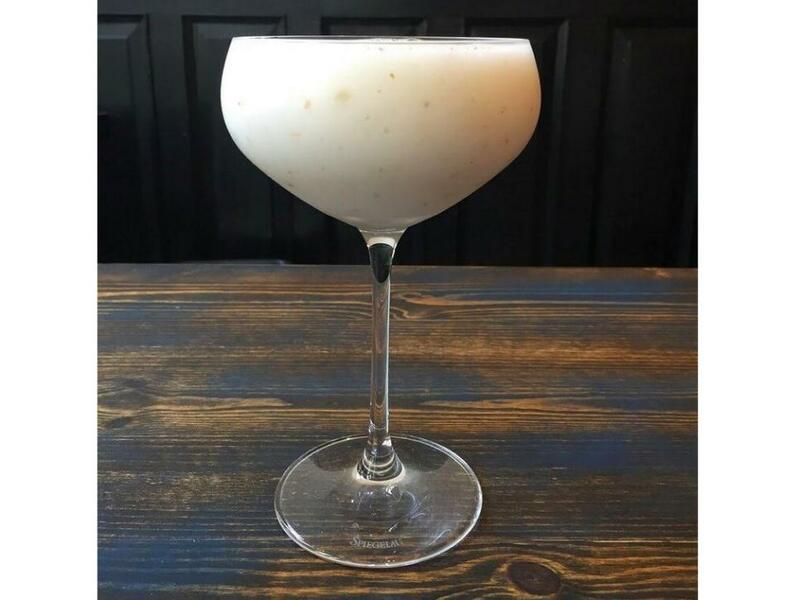 Head bartender Brad Smith's drink at Jeff "Beachbum" Berry’s award-winning tiki bar is a new take on the Banana Banshee — a disco-era frozen sip. 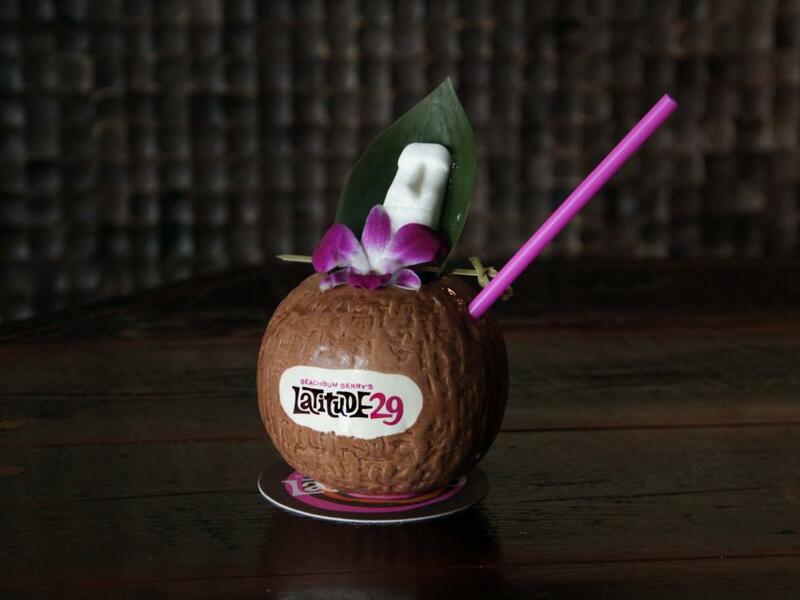 He "steers the 1970s 'boat drink' into uncharted new waters" with layers of flavor; coconut milk, a whole banana, lime, dark Jamaican rum, Aztec chocolate bitters and Angostura bitters are frapped and served in a souvenir mug. During his travels to Spain and Italy, Area 31's lead bartender Benny Hernandez learned to appreciate both Aperol and Tinto de Verano (red wine mixed with Coke or Sprite). 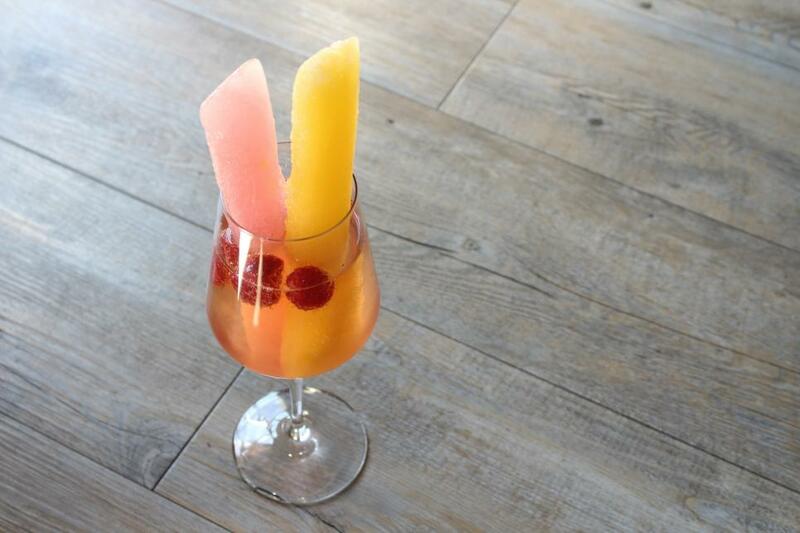 Here, he lends a Miami-friendly Caribbean twist by adding blanco tequila and guava purée to lemon juice, merlot and Aperol, which are blended and served in a hurricane glass garnished with a lemon wheel and thyme sprig. 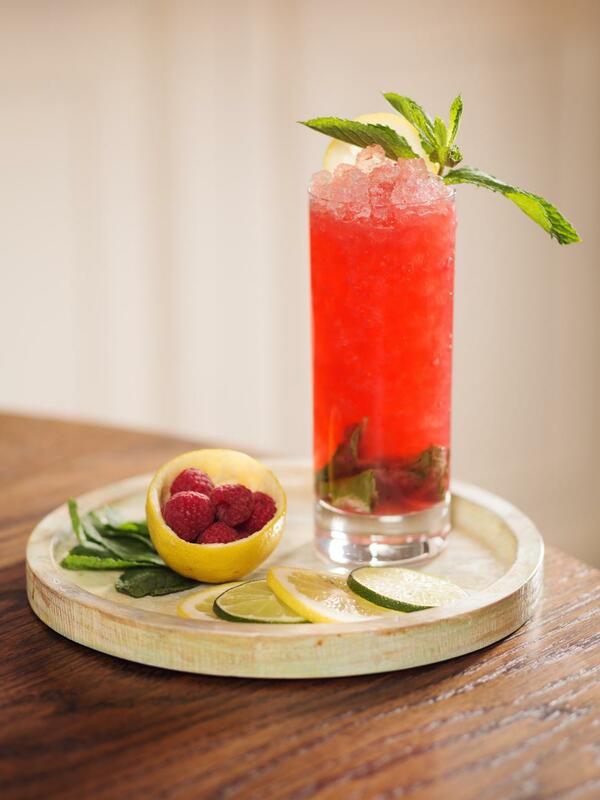 This blended mashup between a champagne cocktail and a mojito combines pomegranate juice, white rum, simple syrup and prosecco, served in a highball glass garnished with a mint sprig. Light and refreshing, it works just as well for day drinking as it does for warm summer evening imbibing, with an added dose of antioxidants from the juice procured from those red arils. Basically a mint julep kicked up with absinthe in lieu of bourbon, this cocktail lets the Bluebird Cocktail Room, a speakeasy-esque Baltimore craft cocktail bar, offer something fun and refreshing while staying true to its roots. 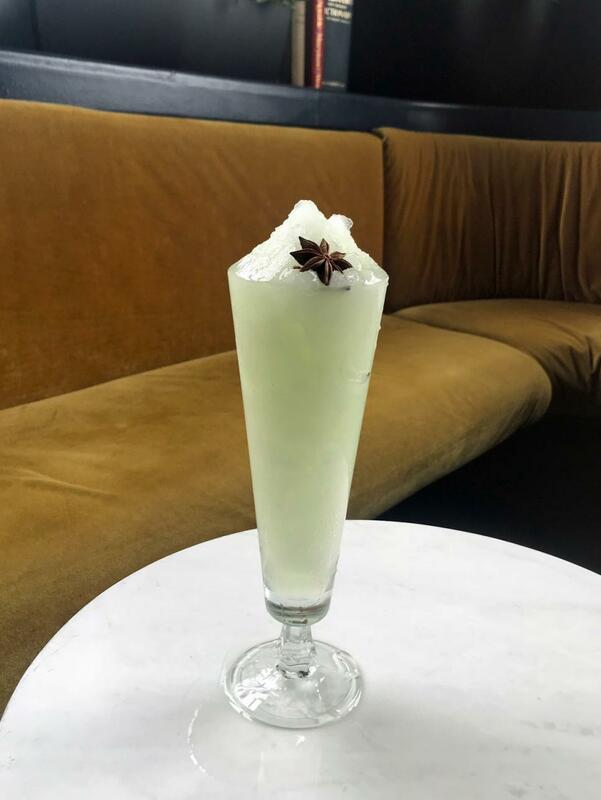 Absinthe, simple syrup and mint extract are blended until smooth, and the light-green concoction is served in a tall glass garnished with a fragrant star anise pod. One sip of this earthy root-driven drink, and thoughts turn to summertime, even while canning vegetables in winter, says bartender Jacque Laura. Beets are steamed, mixed with agave nectar and puréed, then blended with reposado tequila, Grand Marnier, freshly squeezed orange juice and ice. 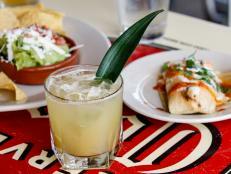 It’s served in a rocks glass topped with lip-tingling sliced jalapenos. Ben Parsons, founder of and winemaker at this urban winery and bar, created a fun twist on the convenience-store favorite. One of IMT’s wines — from rosé to syrah to merlot — is mixed with ice and simple syrup. The trick to the tipple is to get the wine’s residual sugar high enough to freeze without compromising flavor. 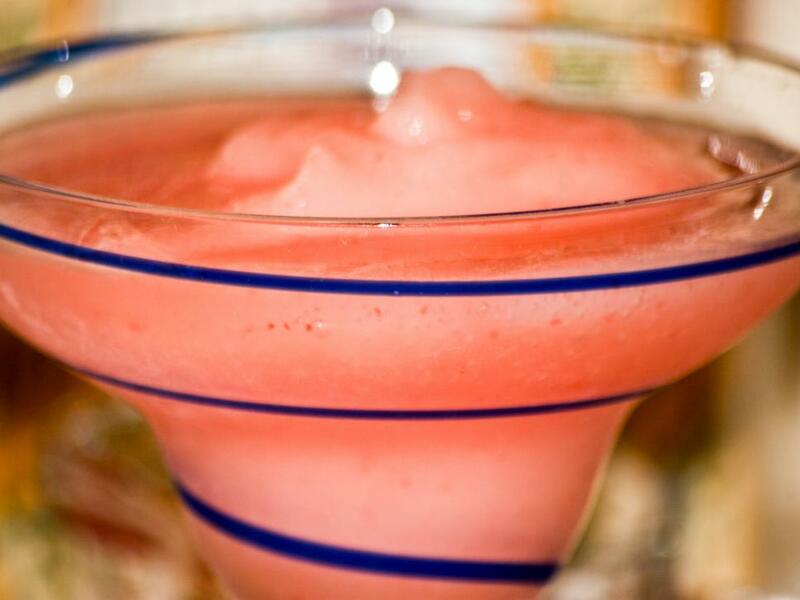 Oenophiles and slushy fans agree: This is one tasty treat. This creamy, dreamy cocktail may look deceptively simple in the glass, but one sip and you can tell it’s about as far from a Pina Colada as you can get. 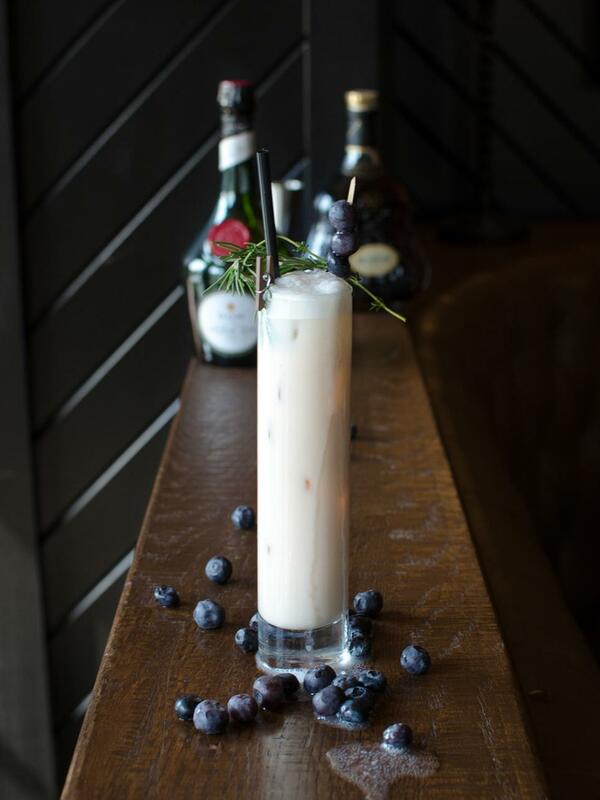 Blueberries are muddled, then shaken with cognac, cream, apple blossom bitters and herbaceous Scotch-based liqueur, all served over crushed ice for a decidedly grown-up boozy shake. Inspired by the endless fields of grains and the huckleberries that grow wild in the Montana mountains, this punch is named for the gold-seekers (who were more likely to find berries than nuggets). Huckleberries and lemons are muddled, then shaken with the distillery’s 1889 Whiskey, honey simple syrup, lemonade and lavender bitters. The tang of juicy blackberries and the distinctive herbiness of fuzzy green sage leaves are a perfect match in this purple-hued smash. 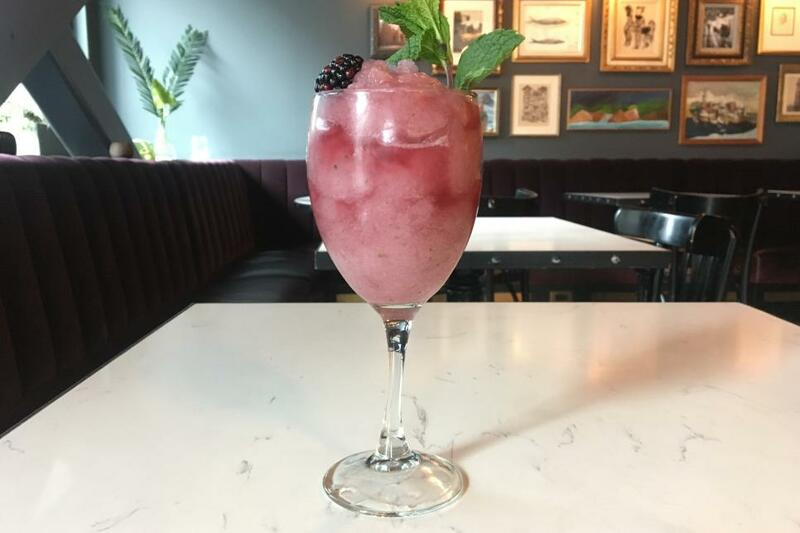 Fresh blackberries and brown-sugar simple syrup are muddled, then blended with grapefruit juice and tequila, for an aesthetically gorgeous yet unconventional herbal summer sipper. Beverage director Maurice Juarez’s spin on the Moscow Mule is named for unscrupulous behavior, monkey business and shenanigans — exactly what you expect to do when it gets seasonably warm outside. 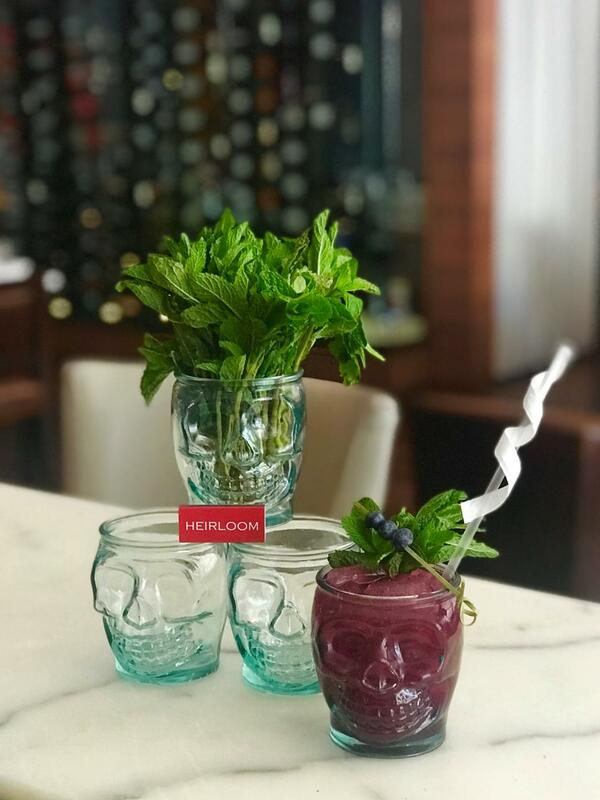 He shakes pot-still bourbon with blueberry syrup and lemon juice, served in a skull glass filled with crushed ice and ginger beer and garnished with blueberries and mint. 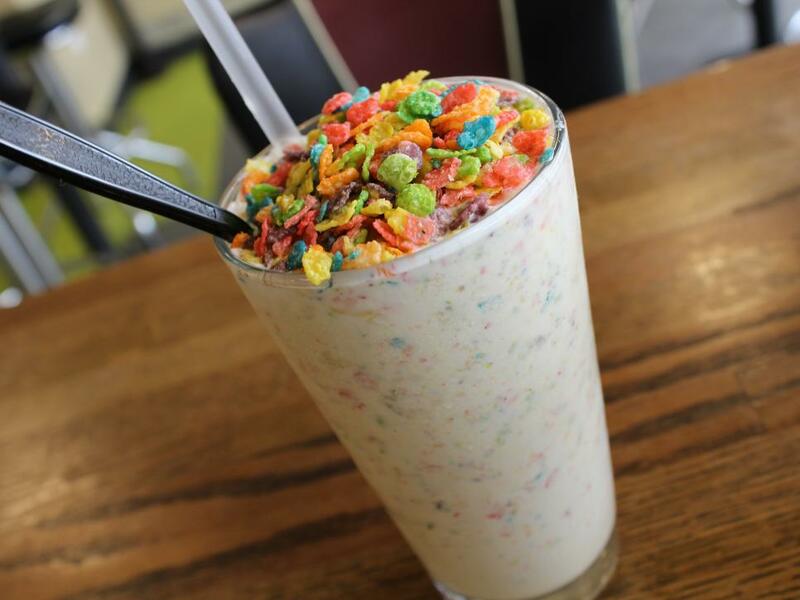 A spiked version of the restaurant’s wildly popular cereal shakes, this nostalgic sip originally appeared on the menu during the 2012 Des Moines PrideFest; today it’s one of the most-requested drinks. 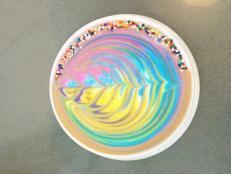 The childhood throwback is made with Fruit Loops-flavored vodka, vanilla ice cream and homemade marshmallow cream, and topped with a big ol’ heap of Fruity Pebbles. A refreshing favorite from one sunny oasis (Cuba) to another (Oahu), this modern twist on the mojito blends the island’s flavors in a unique way. 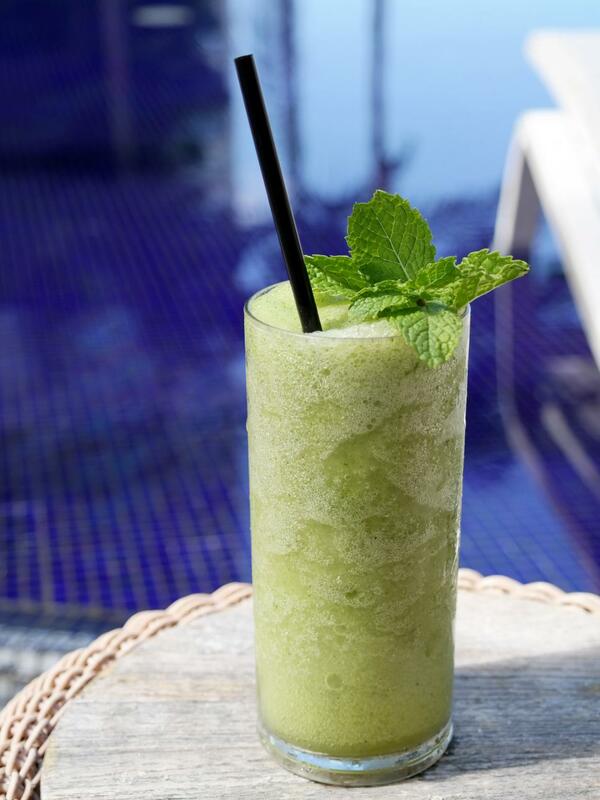 The mixture of coconut rum, coconut syrup, mint, housemade nondairy horchata and lime is blended together with ice, and the result is a green concoction that looks as verdant as Oahu’s lush landscape. Bartender Travis Sanders’ Bramble is reminiscent of two memories from his lifetime in Seattle: walking to Luther Burbank park as a kid with the dogs and a bucket to pick fresh blackberries for jam for his PB&Js, and uncorking a chilled bottle of rosé on a boat on Lake Washington. 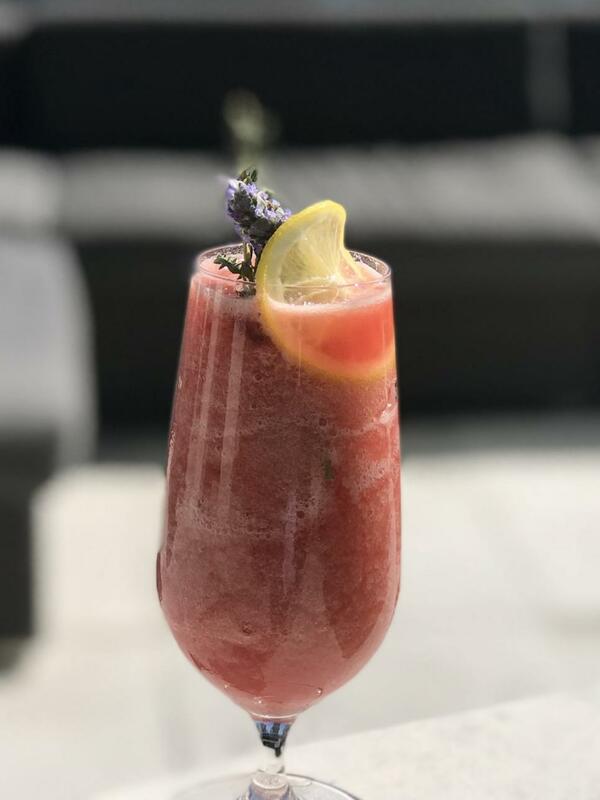 He blends gin, blackberry liqueur, pineapple juice, Campari and mint with a syrup made with rosé, cherries and hibiscus tea, for that perfect patio pounder. 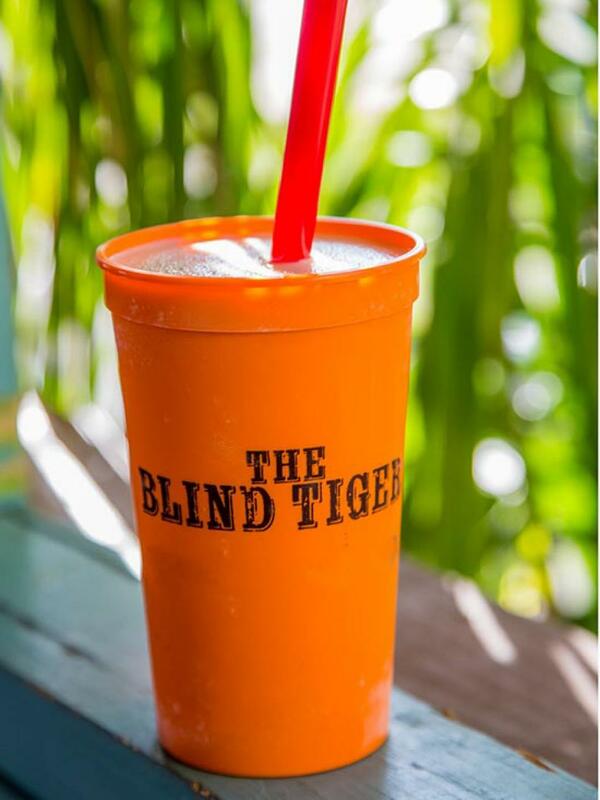 Grab an umbrella-shaded patio table at this brightly painted beachside restaurant on Mississippi’s Gulf Coast, and try their version of the coastal classic drink invented in St. Thomas and made popular on Pensacola Beach. 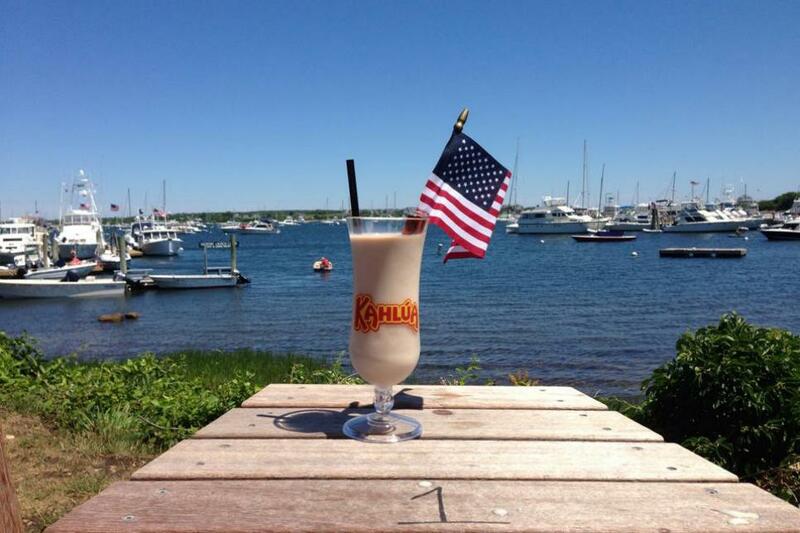 Vanilla ice cream is blended with coconut rum, coffee liqueur and overproof rum, served in a souvenir cup and topped with an optional rum floater. 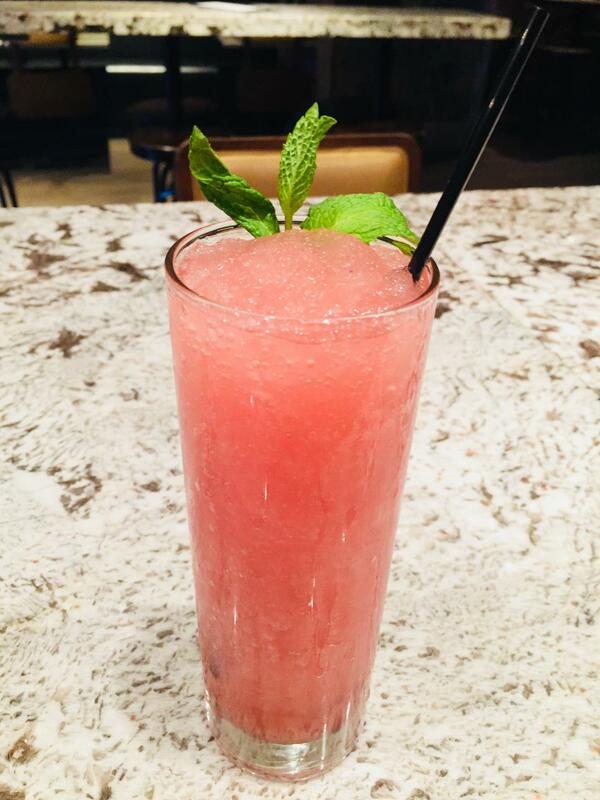 After tasting a rum-based watermelon drink at a bar overlooking the Missouri River, bartender Chris Watson decided to try his hand at a frozen riff on it. 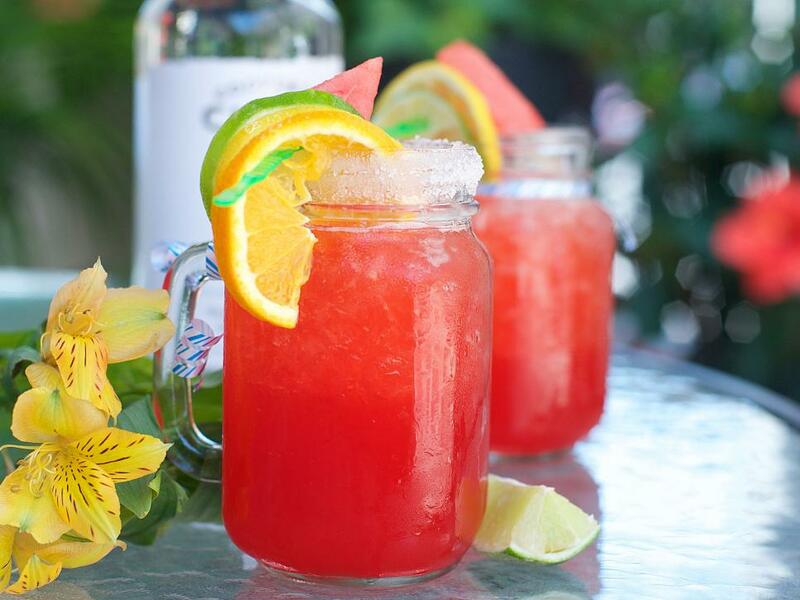 Watson adds ice to cubed seedless watermelon, lemonade concentrate and local vodka, blends it and serves the mixture in a sugar-rimmed Mason jar garnished with more melon and some lemon. Dodge City Daiquiri at Boot Hill Distillery: Dodge City, Kan. This new bar and microdistillery uses its own vodka, as well as freshly squeezed lime juice, lime liqueur, grenadine and agave syrup, for this blended daiquiri. Light, refreshing and just a tad sweet, it’ll fix you right up on one of those dry and windy western Kansas days that quickly turns into a chilly evening if you find yourself lingering too long over your glass. 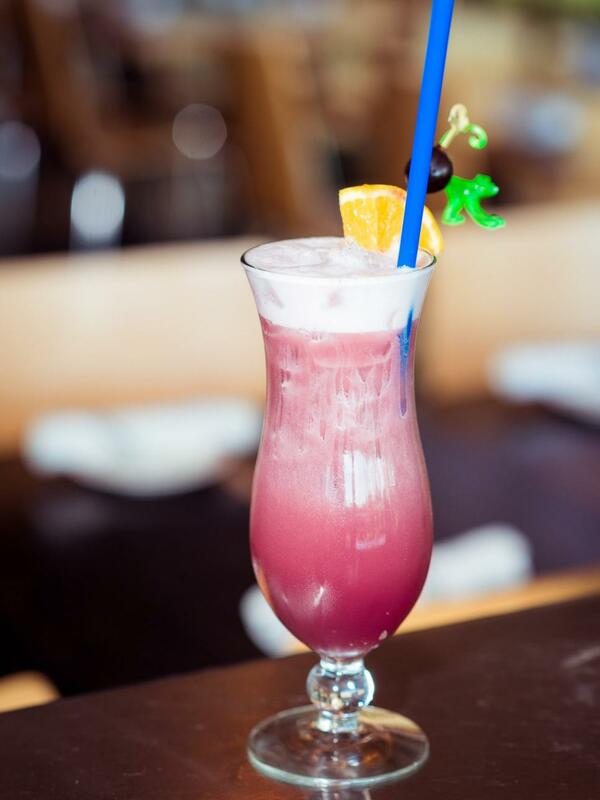 Cliff House food and beverage manager Caitlin Lee combines her love of tiki drinks with the official state fruit of Maine in this vibrant purple pina colada variant. 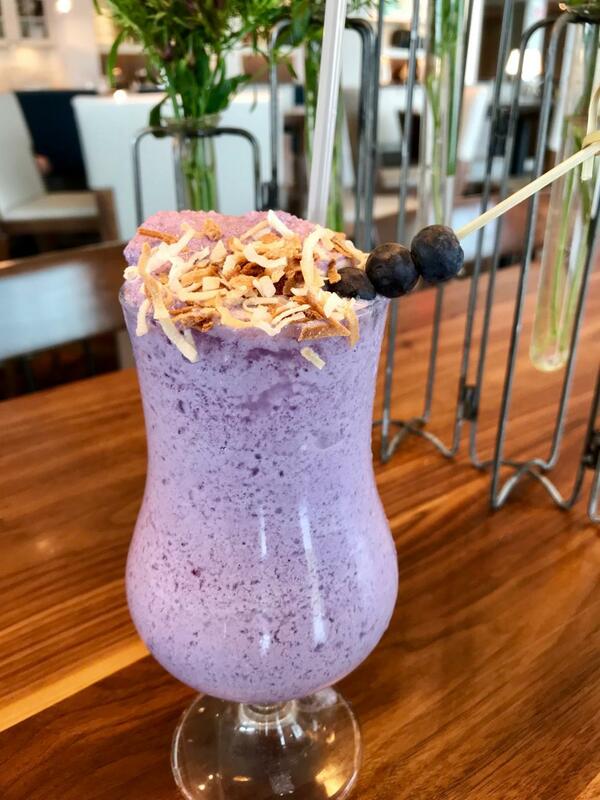 She blends blueberry vodka, blueberry-coconut syrup, pineapple juice and coconut milk to serve in a hurricane glass topped coconut flakes and blueberries. 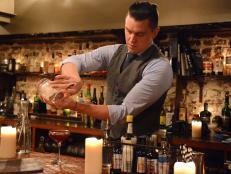 Bartender Kelsey E. Shelton invented the Black Beauty, a bold, citrus-driven whiskey cocktail, to appeal both to the lukewarm imbiber and fans of classic cocktails with a twist. She shakes locally distilled whiskey with lime juice, orange and raspberry liqueurs and a spoonful of blackberry jam, served over crushed ice and spritzed with herby yellow Chartreuse. Summer’s as good a time as any to adopt a new vice. This icy cocktail, from the city’s first shipping-container restaurant, may be addictive, but it also happens to be perfectly legal. 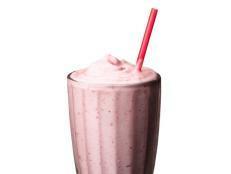 It blends the brand-new spot’s signature strawberry margarita with frozen peach lemonade. 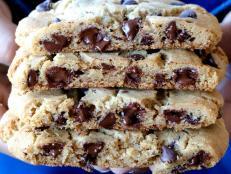 Just like the most illicit of substances, once you taste it you’ll go back for more. 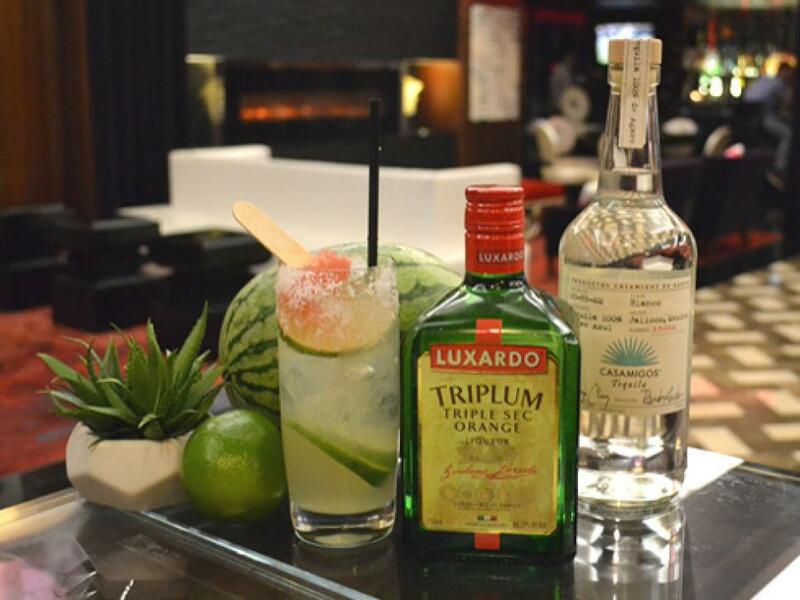 In the spirit of State Fair season, when it seems like everything from fried Oreos to corn dogs is served on a stick, head bartender Mark Forrest makes watermelon margarita popsicles, and dunks one into a traditional margarita made with Casamigos Blanco Tequila. Imbibers can either enjoy the frozen treat solo or let it add fruity essence to the cocktail as it melts. Roxanne at Anasazi Restaurant: Santa Fe, N.M.
Named for a restaurant hostess whose sunny disposition and bright smile match the hue in the glass, this cocktail blends gin with elderflower liqueur, lemon juice and sparkling wine, topped with Aperol and garnished with grapefruit. 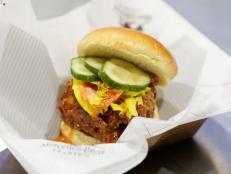 Its refreshing quality is a welcome contrast to the region’s spicy flavors, and it’s a perfect foil for buffalo sliders topped with green-chile marmalade. 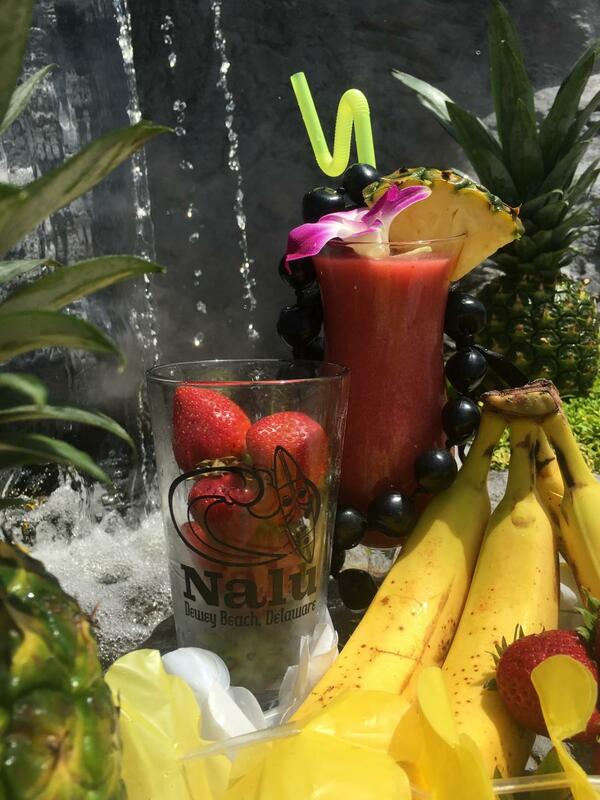 Lava Flow at Nalu Surf Bar & Grill: Dewey Beach, Del. 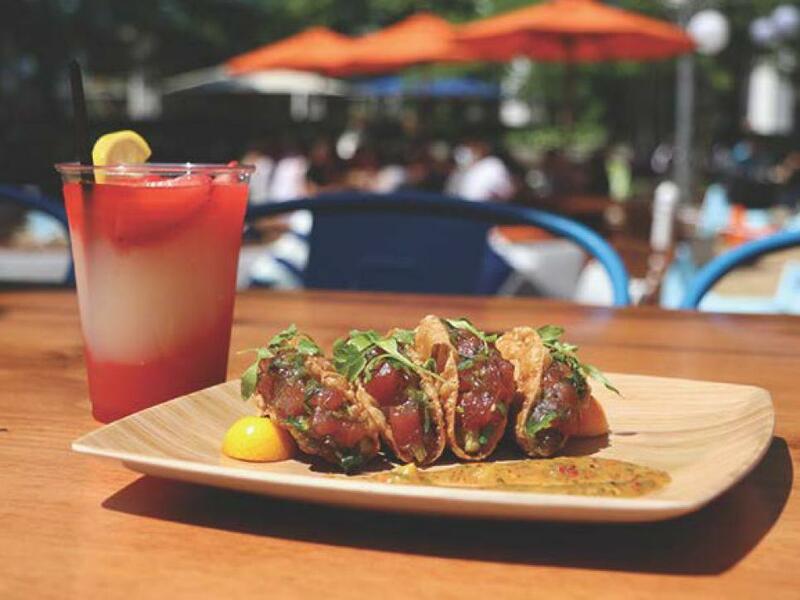 The name of this Hawaiian-themed bar in Dewey Beach, a Delaware seaside party town, translates to "wave," so it’s fitting that you can sit amid palm trees and totem poles while watching some epic hang-10 action on the flat-screen TVs while slurping frozen cocktails. In the Lava Flow, spiced rum coalesces with local strawberries, bananas and coconut-flake puree — an ode to Hawaii’s largest active volcano, Mount Mauna Loa. 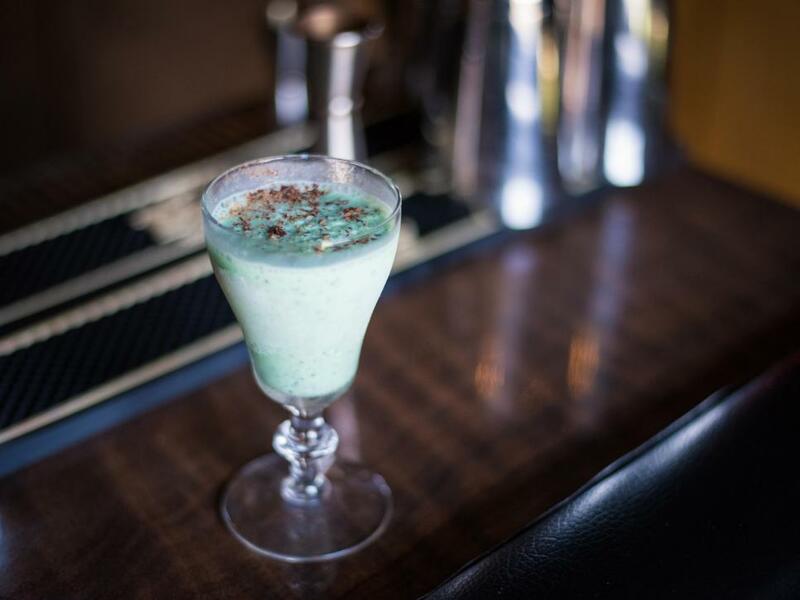 The oft-maligned, creamy green grasshopper cocktail hit peak popularity in the 1950s and 1960s; at R&J, it’s tweaked to include more alcohol, body and flavor. 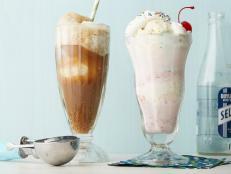 Brandy, creme de menthe, creme de cacao and mint chocolate chip ice cream are blended, poured into a sour glass and topped with shaved chocolate. Icy-cold, minty and boozy, it’s delicious with dinner or in lieu of dessert. For this mojito variant, your choice of vodka or gin stands in for rum. Lime is eschewed for lemon, raspberry gomme is the sweetener instead of simple syrup, and Prosecco adds the fizz instead of club soda. Palate-piquing by the pool, it’s balanced, aromatic and effervescent. 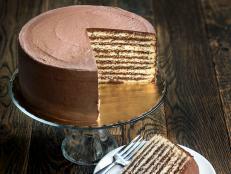 Mother Mason's Delight at Downtown Cheers Grille and Bar: Concord, N.H.
No longer on the printed menu, this sweet treat was created 18 years ago by owner Doug Milbury. 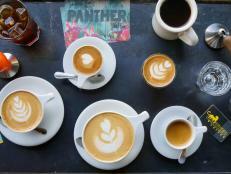 Today it’s still ordered by in-the-know regulars who crave its creamy kick. 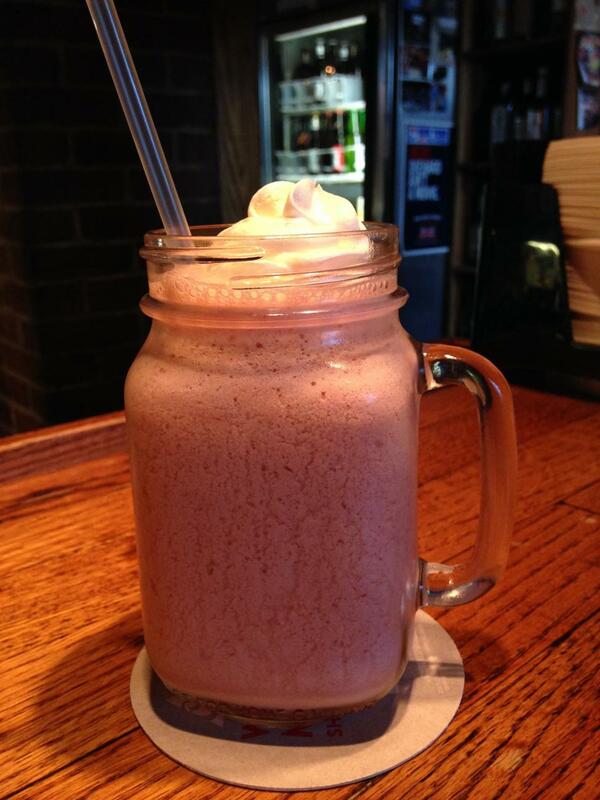 Kahlua, amaretto, strawberries and ice cream are blended with ice, served in a Mason jar, and topped with whipped cream. 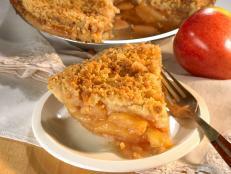 Pass on dessert and order this creamy nightcap. Frozen Summer House at Le Club Avenue: Long Branch, N.J.
At this restaurant, beach club and lounge, a Parisian bistro gets a dose of St. Tropez chic on the Atlantic shorefront. This heady cocktail blends cucumber-scented gin with elderflower liqueur, melon puree, lemon and simple syrup. Sip it and dream of hammocks at an oceanfront beach house. 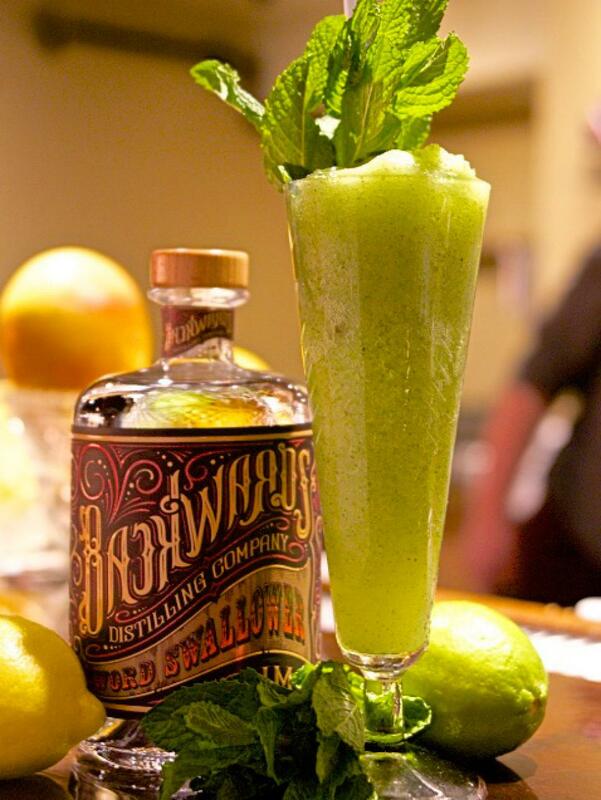 The Backwards Distilling Company in Wyoming is an ode to the circus, and this drink is named for the man who served as the conductor for Ringling Bros. and Barnum & Bailey for 50 years. Reminiscent of the classic tiki cocktail Missionary's Downfall, it blends their Sword Swallower Rum with lime juice, simple and honey syrups, pineapple, mint and ice, garnished with additional mint. After wandering aimlessly around Venice during a trip to Italy 10 years ago, owners John and Stephanie Reitano happened upon a cute little restaurant for dinner. At the end of the meal, the waiter mixed lemon sorbet, vodka and Prosecco, but wouldn’t share the exact recipe. Light, tart and utterly refreshing, the mix the duo concocted at home in Philadelphia perfectly recaptures that memorable night in the City of Bridges. 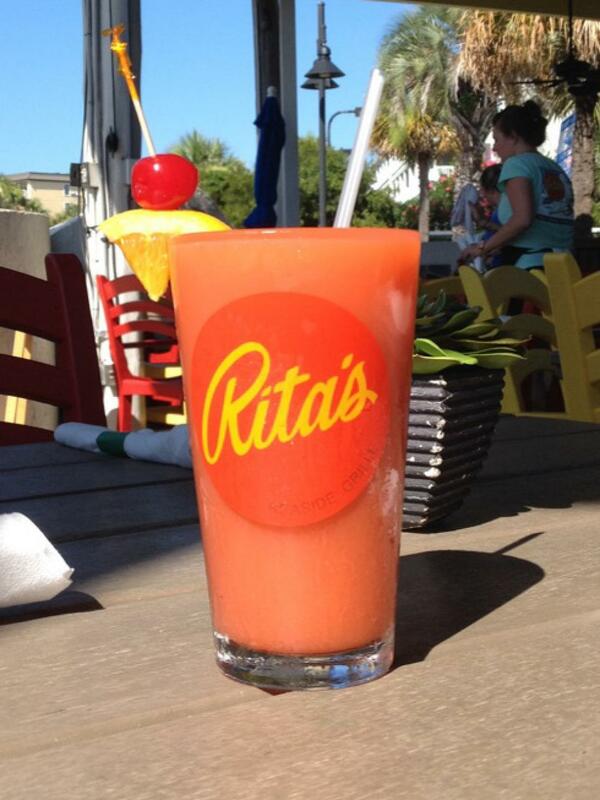 Rita's Frizzle at Rita's Seaside Grille: Folly Beach, S.C.
Premade frozen cocktail mixes just don’t cut it at this relaxed, flip-flop-welcoming beach bar, which serves a full menu of thirst-quenching quaffers. The bar’s blend of light and dark rums, amaretto, ginger beer, orange juice, pineapple juice, and mango and strawberry purees hits the spot after a day of surfing, sailing, swimming or sunbathing. 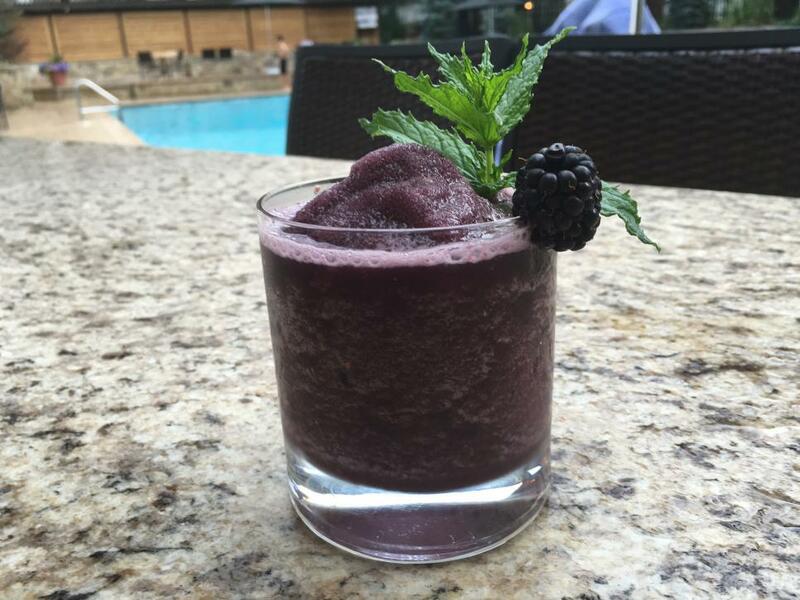 To concoct this fresh, frozen drink, managing partner Amy Eldredge thought about what the essential poolside adult cocktail might look like. 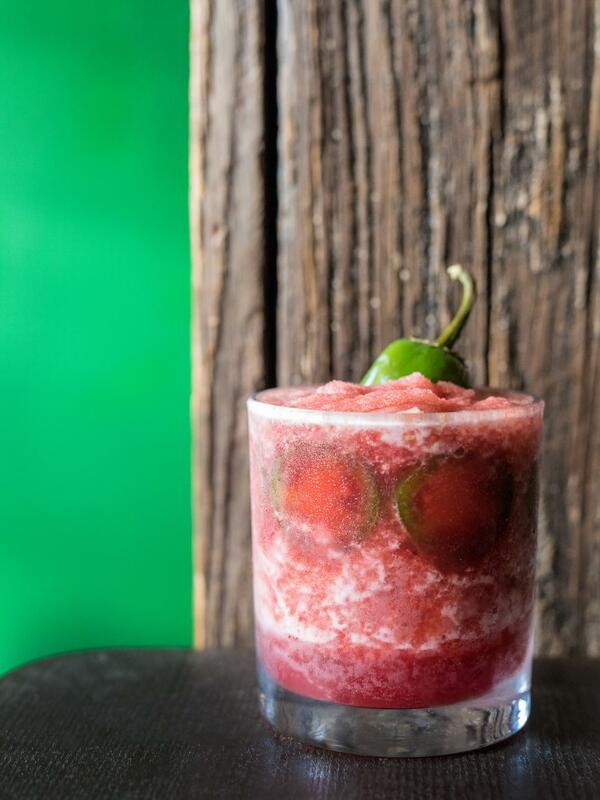 She combines the nostalgia of red, juicy, drippy watermelon with tequila, Cointreau, lime juice and sprigs of mint. 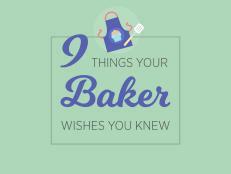 The most-important ingredient, though? Pellet ice, which gives the drink the right temperature, dilution and consistency. 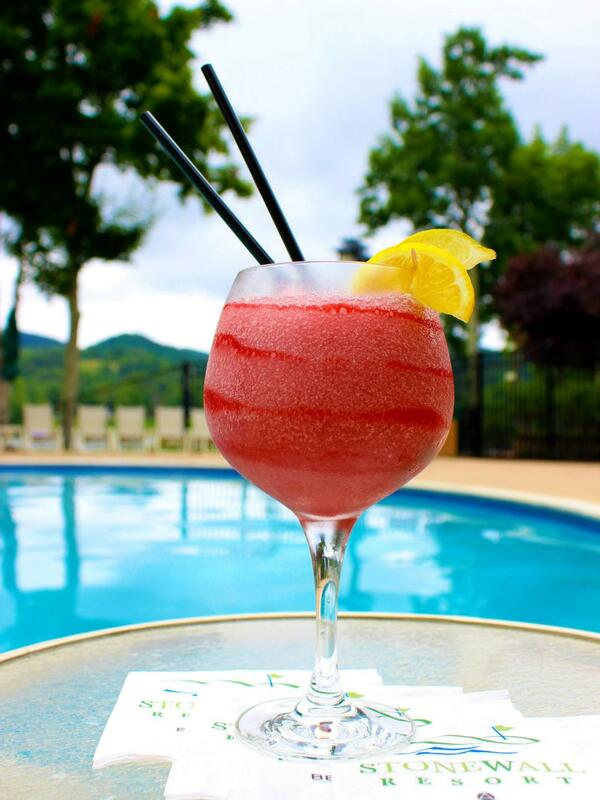 Jackson's Way at Stonewall Resort: Roanoke, W.V. Named for the Confederate general who succeeded Robert E. Lee (and whose name graces the lakefront resort that offers year-round entertainment), this admittedly noncerebral sipper is fizzy and fruity. Citrus rum is blended with raspberry Schnapps, lemonade and Sprite, poured into a red wine glass painted with raspberry sauce, and garnished with lemon and lime. Charming Conrad at The Charmant Hotel: La Crosse, Wis.
To celebrate its first season of alfresco dining, this boutique hotel whipped up a garden-fresh elixir that’s a little bit floral and a little bit creamy. 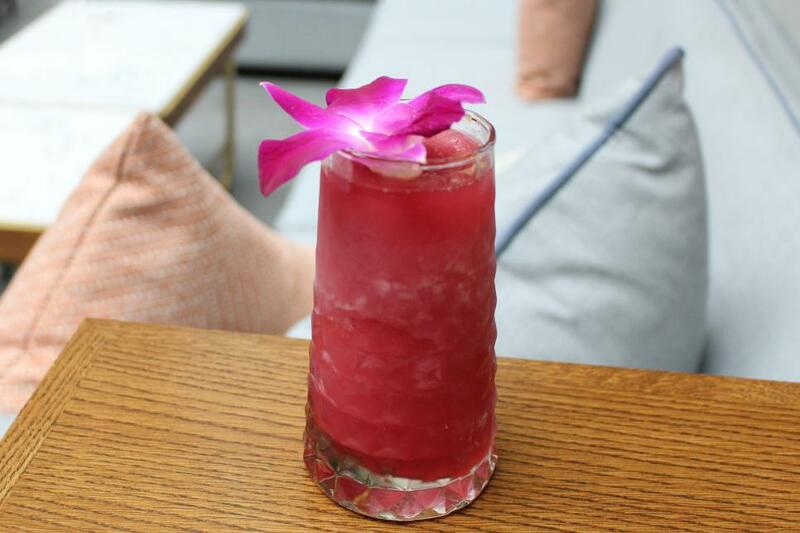 Gin is blended with local vanilla ice cream, Jamaican #2 Bitters, sparkling wine and a syrup infused with hibiscus and mint. 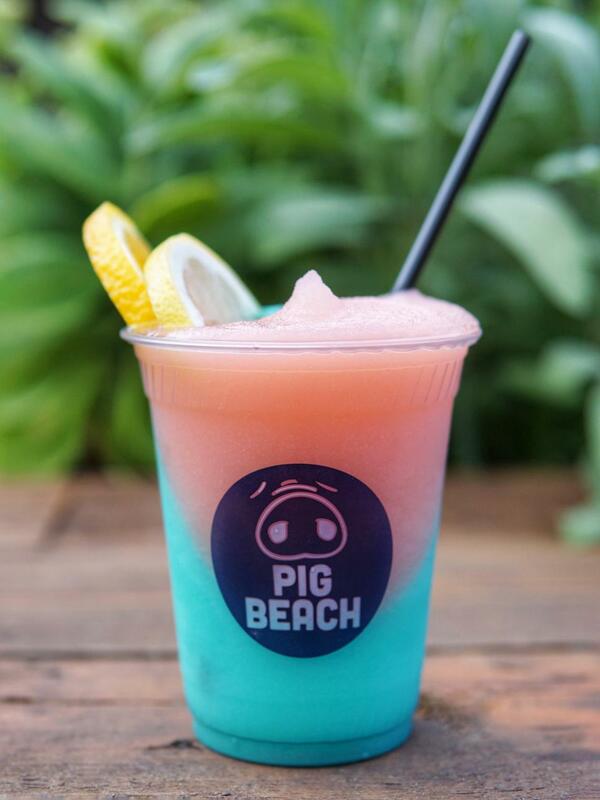 Served over crushed ice in a pint glass, it gives you a whiff of what summer’s all about.